Hyundai said no crashes have occurred as a result of the defect. 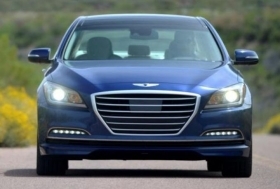 Hyundai Motor co. is recalling about 24,400 2015 Genesis luxury sedans for a water leak issue that could lead to shifter display problems in the car. A defect could cause water to leak into the taillight assemblies and cause an incorrect gear to be displayed on the gauge cluster monitor, and could also delay the engagement of the selected gear. As a result, drivers could accidentally engage the wrong gear based on the incorrect information on the display. This problem can occur because the taillights are connected electrically to the gear selector, and a weak seal could allow water into the assembly. The Genesis sedans affected by this recall were manufactured between Feb. 21, 2014, and Jan. 24, 2015. A fix will involve the installation of pads to prevent water leaks into the taillight assemblies, and this work will be performed at the dealer free of charge.